Whether he drove a fastback Mustang or a squareback microbus, Bob Waldmire was in his wheelhouse on Route 66. He first encountered the charm of the Mother Road as a boy on a family trip to California in 1962. Later, as a young man, Waldmire abandoned his college studies to heed the call of the open road. In the late ’60s and through the ’70s, ’80s and beyond, he followed his dreams, exploring and promoting America’s mainstreet, while developing and selling his remarkably detailed pen-and-ink artwork along the way. His vocational U-turn began while studying zoology and art at Southern Illinois University (SIU). Waldmire was inspired by a fellow student’s detailed, bird’s-eye-view sketch of their Carbondale, Ill., college town. He drew a similar perspective of his Springfield, Ill., hometown, on Route 66. He began selling locally significant designs in university towns and along Route 66. He sold space on his poster art to local businesses and sold the prints on-site at those businesses. 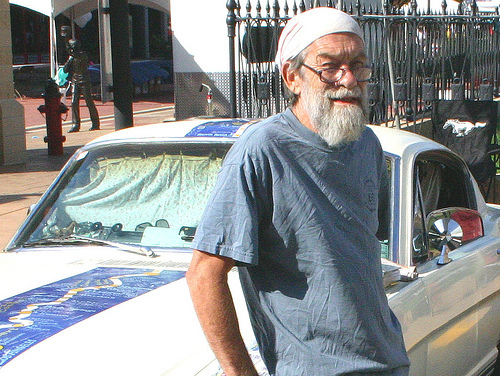 The income fueled his dreams, covering travel expenses and a leisurely, open-road lifestyle. He drove slowly to enjoy the sights and keep byways safe for butterflies and other creatures. He occasionally painted signs for local establishments and stayed at various Route 66 stops, greeting friends with a smile and time to chat. Much of his artwork reflected his advocacy for wildlife preservation, resource conservation, simple living and world peace. Waldmire was born in St. Louis and raised in Springfield, Ill. Throughout most of his adult years, he traveled and lived in a station wagon or bus on Route 66, dividing time between Illinois and Arizona. His eco-friendly lifestyle included oil lamps and a wood-burning stove. Other off-the-grid energy sources included solar panels and windmill-powered electricity. He collected and recycled rainwater, and his extensive gardening included a hothouse for vegetables, herbs and contraband hemp. He cooked meatless chili, stew and pizza, or baked brownies in a solar oven. Occasionally, he would eat eggs if they came from well-tended hens. He enjoyed sipping coffee or herbal tea, reading books, playing the flute, watching wildlife, feeding birds and sharing a smoke from his handcrafted wooden pipe. In a Chicago Sun-Times interview he admitted eating “too many” French fries, potato chips and other processed foods over the years. Waldmire remained a vegetarian despite the fact that the family business revolved around the Cozy Dog – the original breaded “hot dog on a stick.” Bob’s father, Ed Waldmire, invented the Cozy Dog, popular at festivals, fairs and the family restaurant. As young boys, Bob and his brothers helped clean tables and cook hot dogs and burgers. Family members still operate the Cozy Dog Drive In near its original Route 66 location in Springfield, Ill.
Each autumn, Waldmire followed Route 66 from Springfield to the sunny and scenic Southwest. 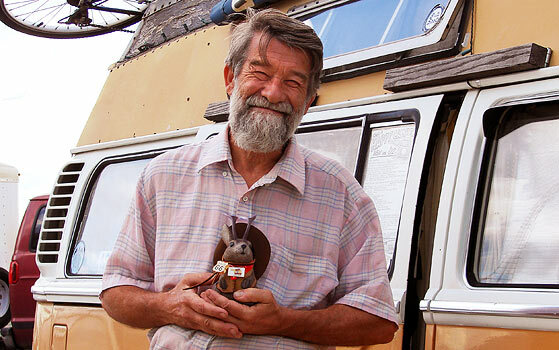 He made even more friends and fans, sketching attractions, and peddling artwork at sites and events along the way. In the early ’90s, Waldmire re-opened the Hackberry General Store as an information and souvenir stop in a deserted Arizona mining town. He eventually sold the store and moved to the Chiricahua Mountain foothills. His artwork and maps often included handwritten notes and commentary. Waldmire drew regional flora and fauna, vintage motels, family-style restaurants, cars, trucks, buses and bikes, full-service gas stations and roadside architecture. He sketched the Rock Café in Stroud, Okla., Angel’s Barbershop in Seligman, Ariz., the Dwight Windmill in Dwight, Ill., and the Cadillac Ranch in Amarillo, Texas. He created a series of large-letter cards spotlighting each of the eight states on Route 66, plus fold-out maps, a color Route 66 overview and more. He captured changing regional landscapes, from Midwest grasslands to desert cactus stands to the coastline’s Santa Monica shore. His diverse subjects included raccoons and jackrabbits, songbirds and hawks, rattlesnakes, scorpions and lizards. At times, Waldmire’s art incorporated his political opposition to nuclear warfare, petroleum-dependence, logging, hunting, animal confinement, industrial farming and over-regulation of hemp. 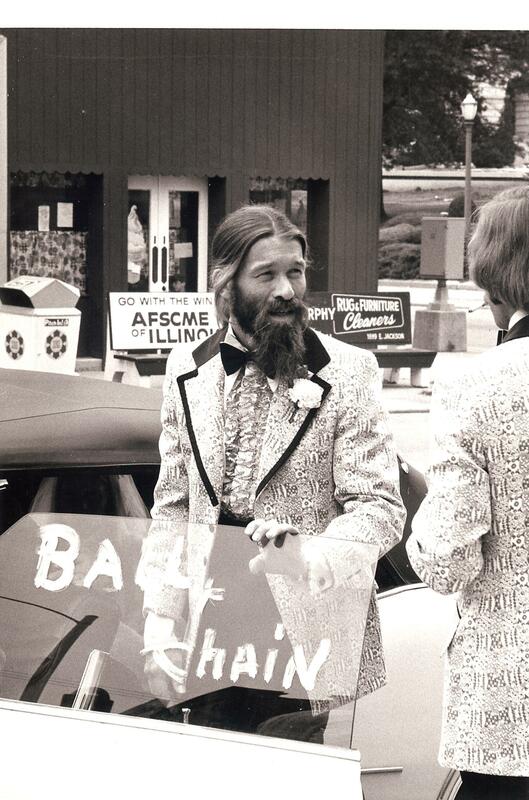 Waldmire proclaimed himself a hippie and the Naturalist of Route 66. Others called him the Mayor and Ambassador of Route 66. In 1985, Waldmire replaced his VW wagon with the orange VW camper bus that became his studio, business office, residence and ride. It had a bike rack on top and a side table where he displayed and sold his art. 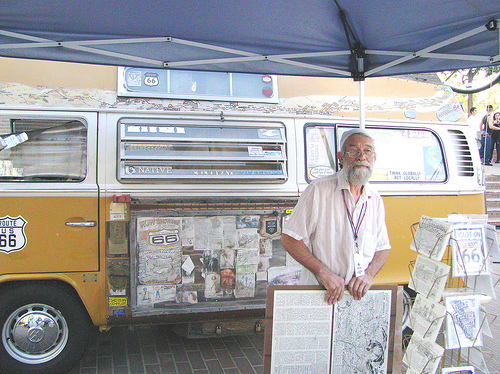 Waldmire dubbed his VW bus a “billboard on wheels.” It was covered inside and out with cause buttons, peace signs and bumper stickers. Bob and his “hippie bus” inspired the “Fillmore” peacenik character in the Disney/Pixar movie “Cars.” Fillmore was a 1960 Volkswagen bus and laid-back Route 66 hippie. Disney/Pixar creatives wanted to name the character Waldmire, but the self-proclaimed “ethical vegetarian” declined permission, including licensing income. Waldmire didn’t want his namesake used in the McDonald’s non-vegetarian Happy Meal toy promotions. Waldmire had fun with the concept, though, drawing his “Waldmire and Fillmore: A Chance Meeting” postcard. It featured a surprised, anthropomorphized version of Waldmire’s orange microbus facing – bumper to bumper – the green Fillmore character. The script noted that the two hippie-bus characters had met “Somewhere on 66.” The colorful background includes detailed landscapes dotted with red Burma Shave signs. The characters also appeared in Waldmire’s sketch of the Rock Cafe in Stroud, Okla. Cafe owner Dawn Welch was the inspiration for Sally, the Porsche character in the “Cars” movie. Waldmire fostered an appreciation for life in the slow lane. He earned the Steinbeck Award from the National Historic Route 66 Federation for preserving and promoting Route 66. He was inducted into the Route 66 Hall of Fame. On December 16, 2009, Bob Waldmire died at the age of 64 after a cancer battle that sidelined his travels, but not his spirit. 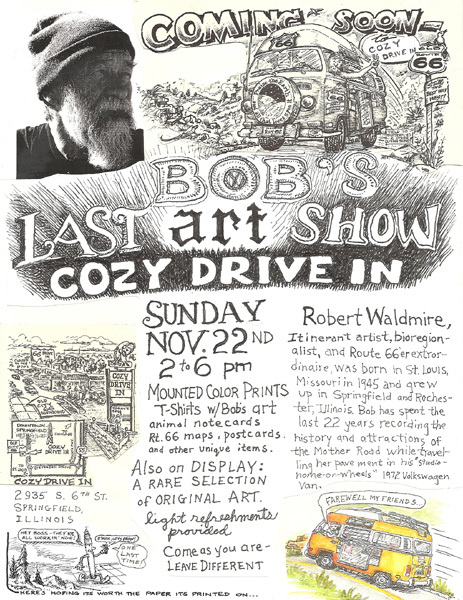 Before he died, he hosted Bob’s Last Art Show at the Cozy Dog, and later welcomed friends who visited his schoolbus-home near his Springfield family home. After he died, his orange microbus and yellow schoolbus were moved to the Route 66 Museum in Pontiac, Ill.
Waldmire had requested that half of his ashes be buried near the gravesite of his parents, Ed and Virginia Waldmire, in Rochester, Ill. He wanted remaining ashes scattered along Route 66, by his second Route 66 home in Portal, Ariz., and at the end of the road in Santa Monica, Calif. His four brothers transported Bob Waldmire’s ashes as “one last ride” and planted Forget-Me-Not flowers on his gravesite. This entry was posted in Bob Waldmire, Illinois Route 66, Travel - Route 66 by MikeR66. Bookmark the permalink.